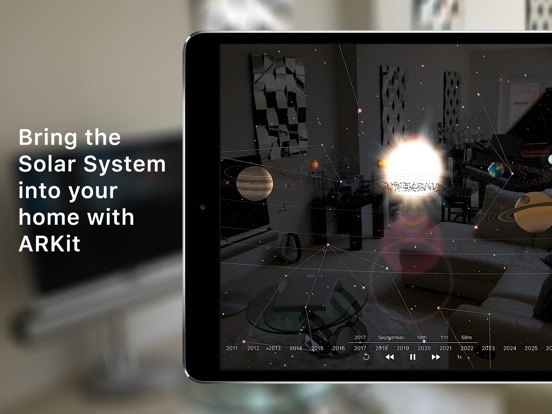 - AR Grand Orrery (Premium Feature) : With iOS 11 bring the Solar System into your home or classroom with the new Grand Orrery feature! 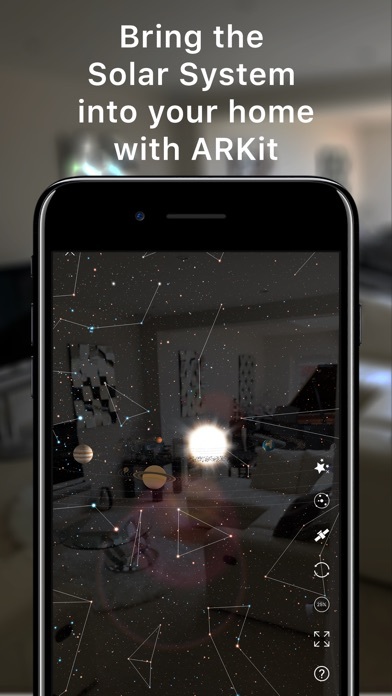 Use augmented reality to walk around the entire solar system, manipulating time and space with your fingertips! Walk up to the planets and see them in great detail, view their moons and surrounding satellites. Even see current space missions in our Solar System! 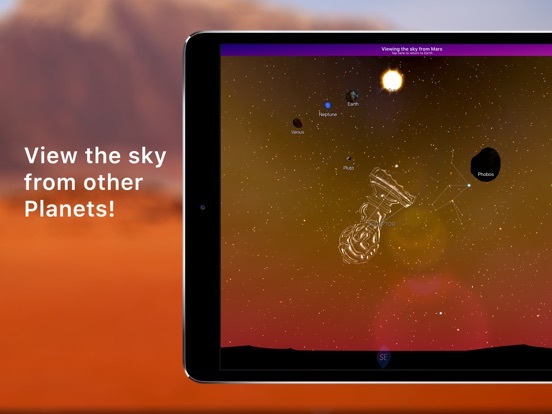 Not only can you explore from space, with our new Grand Orrery you’re able to actually land on the planets and view the sky from Mars or even Jupiters moons for instance! The Night Sky Grand Orrery opens up the sky from any vantage point in our entire Solar System! A super powerful and super magical experience, only possible with Night Sky and iOS 11! 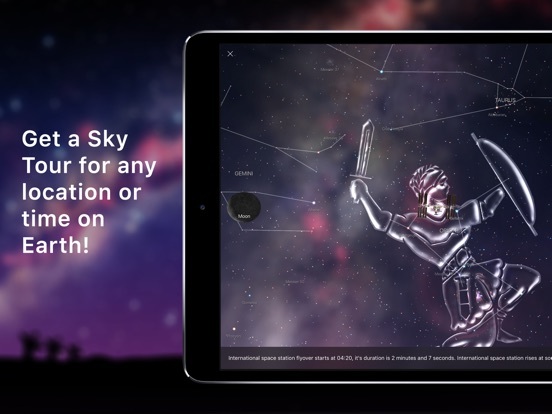 - Live Night Sky Tours: New for Night Sky 5, tap Sky Tours for a tour of the sky above you. 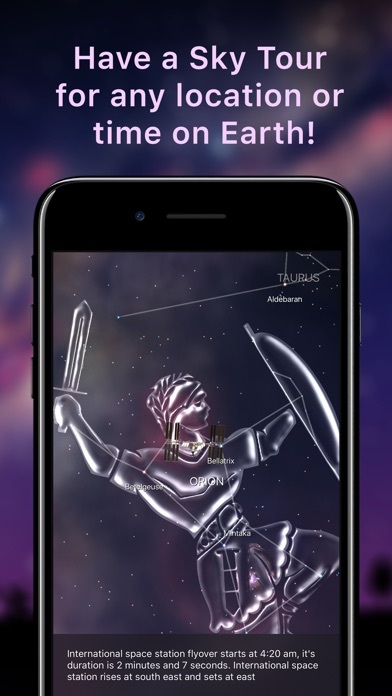 Night Sky will guide you to each constellation currently visible and inform you of the stars. Customize your tour by selecting its duration. - Worldwide Night Sky Tours (Premium Feature): Create your own tours for any location and time in the world! Just drop a pin on the world map, and Night Sky will generate a Sky Tour for that location and save it into My Tours for quick and easy access. Be sure to create a tour for your favorite camp site, and next summer vacation! Your tours are then synced via iCloud to view with Night Sky on tvOS and vice versa! - My Sky Notifications - New for Night Sky 5, completely customize your notifications in Night Sky. Favorite any object from satellites to constellations, and be informed when that object is rising for your current location. We’ve now also included Iridium Flare notifications for your current location. Manage all notifications with a new simple list. Rich notifications appear on your iOS device with beautiful animations. You’ll always be aware when your favorite celestial objects are about to rise! 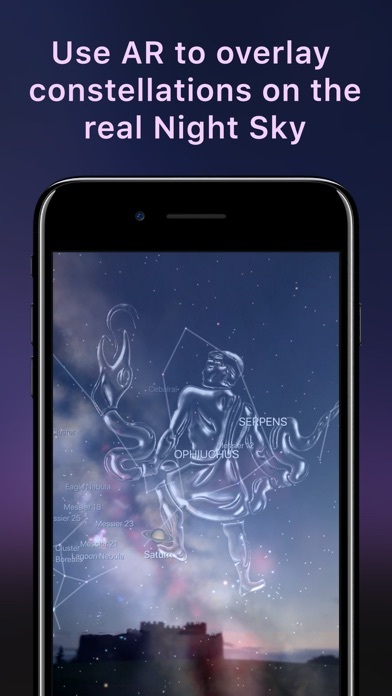 - Power Sky View with Glass Constellations: 115000 celestial objects, deep sky objects, beautiful Glass Constellations, Light Spectrum vision with mesmerising visuals, two finger gesture to increase or decrease Light Pollution, & seamless multilayered animated 3D models. 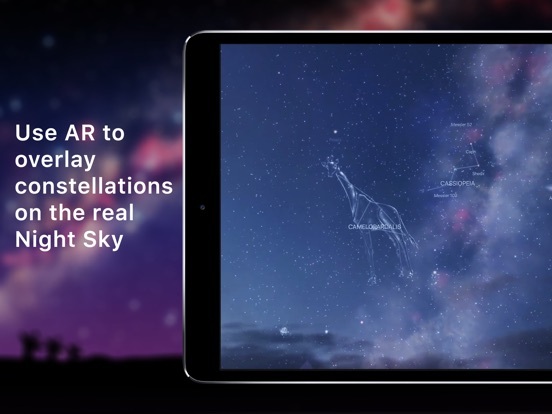 - Magic comes to Apple Watch: We have brought Sky Tracking to Apple Watch in Night Sky on watchOS 4. Simply raise your wrist to the sky to quickly identify stars, planets and constellations! - Land on the Moon (Premium Feature): Moon Tours - One giant leap for innovation. We’ve accurately recreated the Apollo 11 and Apollo 15 lunar landing sites in a 3D environment as they would appear if you we’re there today! 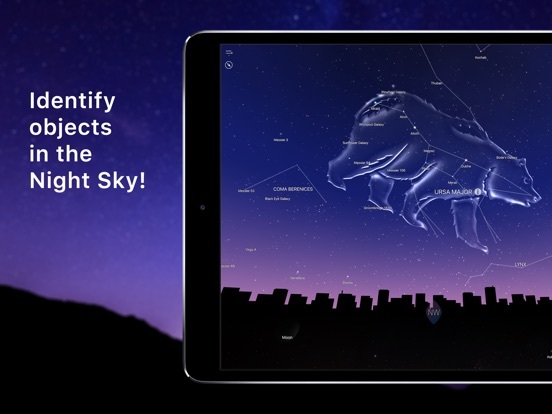 - Night Sky Tonight: Get a totally customized experience, Night Sky Tonight gives you an animated view of the sky above you from Sunset to Sunrise. You can scrub through the night to see all celestial events happening local to you. - Accessibility - Improved Voiceover - Night Sky now describes objects identified in Sky View to users with Voiceover enabled! 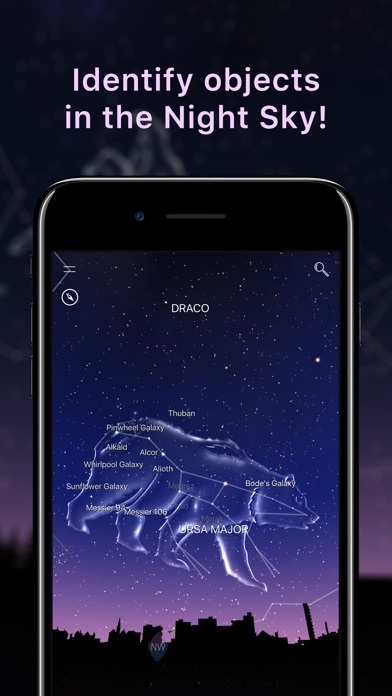 Night Sky is the only stargazing app that enables users to hear the sky - an incredible experience for our Voiceover users. We've now built on top of Voiceover identification, with Voiceover description. Everyone can experience the beauty of Night Sky. - Full Arabic and Hebrew professional localization. Night Sky has now been fully localized into Arabic and Hebrew. If your iOS device is set to these languages, Night Sky will also appear in Arabic or Hebrew. - Iridium Flare Notification Improvements - Night Sky now notifies you of the Iridium number and magnitude of the flare in Iridium Flare notifications on iOS and watchOS. 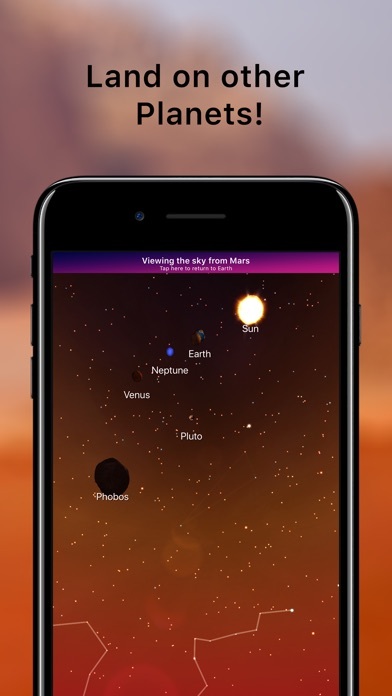 - AR Sky Blending Improvements - when turning on AR Sky Blending, Real Sky Representation auto enables making planets appear their actual size in the sky. This automatically reverts back to your existing preference when AR Sky Blending is turned off. - Latest News interface improvements. - Improvements to Brazilian Portuguese translation. - AR Grand Orrery and Sky View corrections to Uranus, and Hyperion has an updated texture. - Added option to turn on or off Meteor Shower animations in Sky View from Preferences. - Additional minor bug fixes and enhancements.